Greg Sloggett heads Derry into a first half lead against his old club. DERRY CITY moved into third place in the SSE Airtricity Premier Division as Declan Devine marked his 100th match in charge of the Brandywell club with a comfortable victory over UCD in Belfield. It was the in-form Candy Stripes' third consecutive league win and their fourth in all competitions as they rose two points above champions, Dundalk who lost to Sligo Rovers. 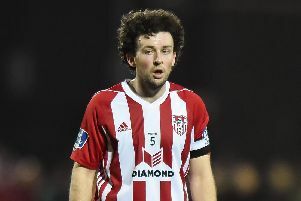 Greg Sloggett opened his Derry account with a diving header against his former club after 23 minutes. In a pre-match interview UCD boss, Collie O'Neill felt the midfielder would find the game 'mentally tough' coming back to his former stomping ground but that certainly wasn't the case as he headed City into a deserved lead. Darren Cole, who returned to the starting line-up then scored his first goal since the EA Sports Cup Final victory last season when he fired in Derry's second of the night on 72 minutes. Devine made three changes from the team which defeated Finn Harps last week with experienced keeper, Peter Cherrie returning from a hand injury to reclaim the No.1 spot from Nathan Gartside. The injured Conor McDermott (hip) and suspended Jamie McDonagh were replaced by Darren Cole and Eoghan Stokes respectively but the big news was that left-back, Ciaran Coll was handed a starting berth as he made a full recovery from that horror tackle sustained in the north west derby. Interestingly Devine opted to start with skipper, Barry McNamee in a holding midfield role with Ciaron Harkin playing in behind David Parkhouse. UCD, meanwhile, remained unchanged from the team which defeated Waterford 4-1 at the Bowl last Friday night. There was just once change from the Students' side which lost 3-0 to Derry on the opening night of the season with Yoyo Mahdy leading the attack instead of former Reading striker, Conor Davis. The first chance of the match arrived on seven minutes when Harkin latched onto Parkhouse's flick on, took a touch to take him past his man but blasted his shot high over the target. Eoin Toal found himself in the referee's book on 13 minutes for a foul on Neil Farrugia right on the edge of the Derry penalty area. UCD skipper, Gary O'Neill tried his luck with a powerful free-kick but Ally Gilchrist headed clear the danger. Sloggett was denied what looked a certain goal when Harkin's cross was flicked on by Cole and the ex-UCD man's point blank header was saved superbly by Conor Kearns. From the resultant corner, McNamee crossed dangerously and this time Sloggett connected well with a diving header at the far post which found its way into the net as City took the lead with 23 minutes on the clock. Junior Ogedi-Uzokwe looked bright and when he chested a long ball down into the path of Stokes, the Dubliner struck a decent 25 yards effort which was saved by Kearns. Derry broke at pace after a terrific pass from Sloggett which sent Harkin clear and when Ogedi-Uzokwe dribbled past his man he found McNamee at the near post but his shot was deflected just wide by a crucial last ditch tackle from O'Neill. From the corner the ball fell to Gilchrist and his snapshot was turned behind at the second attempt by Kearns as City finished the half strongly. Derry started with purpose after the break and almost carved open a chance when Parkhouse set Harkin clear but the midfielder's attempt at a return pass was intercepted by Josh Collins. At the other end O'Neill swung in a corner kick and Liam Scales guided his header wide of the far post. The Students were enjoying the majority of possession without penetrating the City rearguard but O'Neill came close on 69 minutes when he drilled his shot just wide of the post from 20 yards. Derry doubled their advantage on 72 minutes when UCD failed to clear McNamee's inswinging corner and it fell kindly into the path of Cole who took a touch before finding the bottom corner of the net with the aid of a slight deflection. That proved enough for the Candy Stripes who will quickly regroup for another trip to Dublin on Monday when they take on St Patrick's Athletic at Richmond Park. UCD - C. Kearns; D. Tobin, J. Collins, L. Scales, M. Dignam, N. Farrugia, T. Molloy, G. O'Neill, J.. McClelland (K. Coffey 77); R. O'Farrell (P. Doyle 77); Y. Mahdy (S. McDonald 86); Subs Not Used - G. Sherifan, E. Farrell, D. Corcoran, L. Boore. Derry City - P. Cherrie; D. Cole, E. Toal, A. Gilchrist, C. Coll; E. Stokes (G. Bruna 72), G. Sloggett, C. Harkin (E. Tweed 90), J. Ogedi-Uzokwe; B. McNamee; D. Parkhouse (P. McClean 86); Subs Not Used - N. Gartside, S. McNamee, J. Kerr, G. Seraf.